Despite recent claims that this project didn’t exist, Marvel has announced they’re bringing 2014’s biggest movie (so far) to television with the animated series Marvel’s Guardians of the Galaxy! The wackiest group of intergalactic badasses will make their way to Disney XD in 2015, and you can catch your first look at what the series has to offer with the test footage seen below. Even though it’s only test footage, this is some pretty impressive animation, unleashing a vast array of bright colors on top of explosions, gunplay and a wily raccoon who survives it all without a scratch. Seeing Rocket Raccoon brandishing giant blasters in 2D animated form doesn’t quite have the same effect as it did in James Gunn’s film, but this universe he and Star-Lord are in is thankfully just as vibrant as its big screen counterpart. I can’t wait to see what happens when they head into space. It’s going to be magical, guys. The Guardians of the Galaxy series announcement was made by Marvel’s Head of Television Jeff Loeb earlier today at New York Comic Con. The series will have the usual gang behind it, with Marvel’s core squad of producers and execs backing it. (Can we get an animated Stan Lee cameo in the first episode?) Take a look at the first piece of key art for the series (via EW), which gives us a good look at Drax, Gamora and Groot with his fireflies. Star-Lord is sitting just how I will be once this series debuts. No word on whether or not the film’s cast will be reprising their roles for the small screen version. It obviously wasn’t Chris Pratt or Bradley Cooper in the test footage, but that’s expected. Bigger stars usually don’t cross over into the animated sector, but it’s not unheard of. Star Wars Rebels, also a Disney XD series, is using Star Wars actors, so let’s just hope the cast is game for voice work. Be on the lookout for Vin Diesel posting Facebook photos of himself in a recording booth. 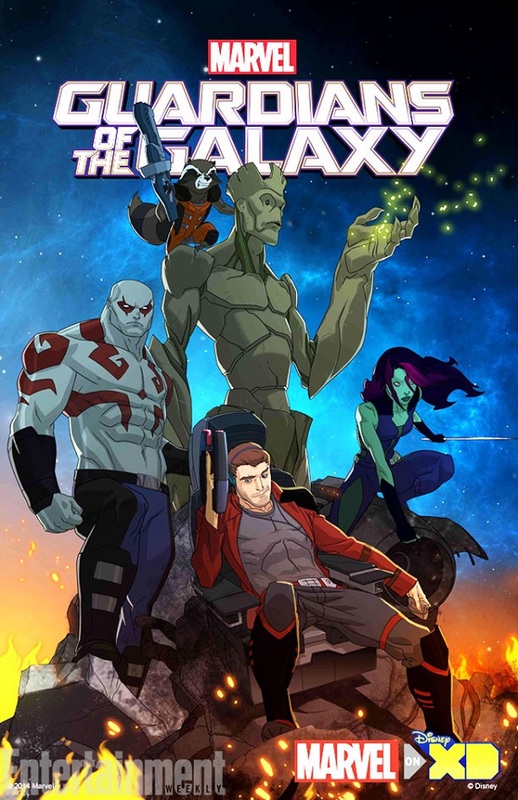 An animated version of Guardians and the Galaxy has been discussed for over a year now, but Marvel Vice President of Animation Stephen Wacker came out in August and said that the company had never announced such a thing and had no plans on going forward with it. He acknowledged that test footage existed – presumably the clip we saw above – but said no series was forthcoming. Anyone worth their salt in entertainment capitalism knew that claim probably wouldn’t be legit for long, and here we are. Put on your favorite mixtape and stay tuned for more info regarding this stellar new project. Are you guys as excited as I am?